When the Aldersgate ReNew campus started in west Wichita in 2016, it didn’t realize it had to keep a tradition going. The former At the Well United Methodist Church, whose building ReNew took over, had hosted a Christmas party for underprivileged youth, ages 13-17, in the neighborhood. But no one had told ReNew about it. “Last year, we kind of threw it together,” said the Rev. Jordan McFall, ReNew pastor. The 2017 version of the Christmas gathering, on Dec. 14, expanded the guest list to include about 20 families from within a five-mile radius of the building, McFall said. “We wanted to connect with the families that lived closer,” he said. The night included a lasagna meal (with items donated by the local Kwik Shop convenience store chain), a bus tour of Christmas lights in the Wichita area, and crafts to make magnetic picture frames for photos with Santa that were taken. Each family received a large, plush throw blanket with a replica of the Wichita city flag and the ReNew logo. McFall said about 150 meals were served. Many ReNew volunteers guided the children through the meal line and crafts, and helped them get one of the two buses. Among them was Jaime and Edna Lopez. 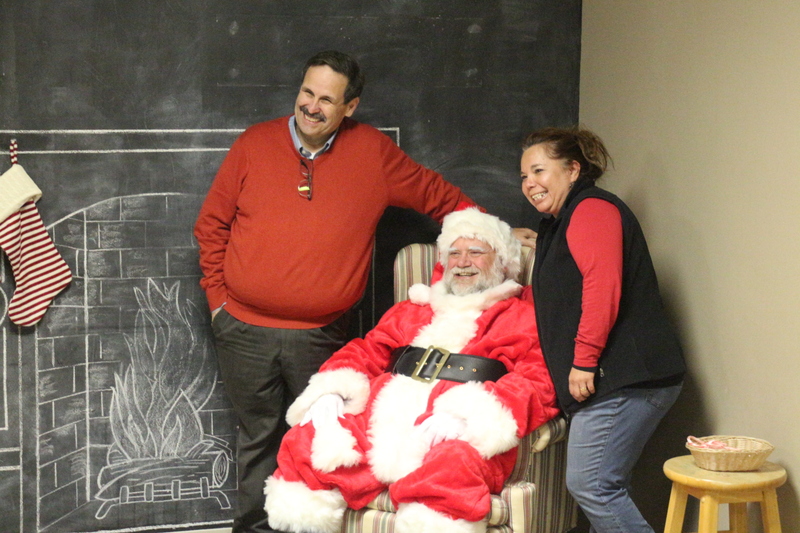 The celebration of Christmas and giving to the community even got to the man playing Santa Claus.